So this week officially ends the DC Universe as we’ve known it. 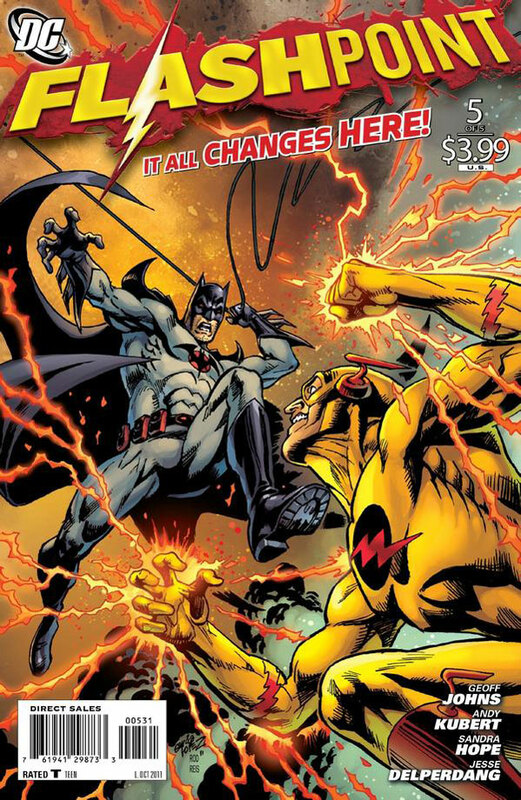 Series like Action Comics (ending at #904) and Detective Comics (ending at #881) that have been published without interruption since the 1930’s have come to an end (although technically they ran to issue #1,000,000) and it’s all because of Flashpoint. After having this day marked on our calendars for months as where it all ends, a wise publishing move on DC’s part also gave us the first of their “New 52” in Justice League #1, which we’ll be discussing later today. 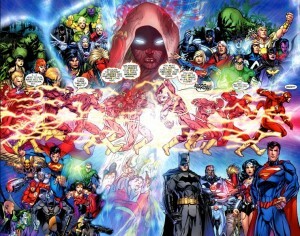 Spoilers for Flashpoint and the last day of the DC Universe will follow. 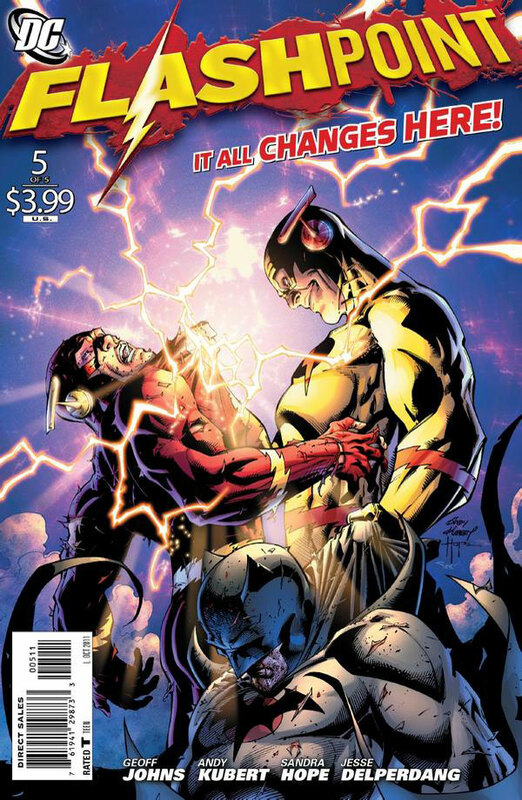 PTB: Things pick up right where they left off in Flashpoint #4 as the Reverse Flash, Eobard Thawne, finally confronts the Flash, Barry Allen. He refers to Barry as his hero, his inspiration during their fight. It added some creepiness knowing that Thawne murdered Barry’s mother. KevinMLD: That’s a weird quirk to Thawne’s origin. He became the Reverse Flash originally because he wanted to be like the Flash and eventually became his greatest enemy. PTB: Barry’s mother’s death and his efforts to undo it were the catalyst for this whole broken world coming into existence. I definitely enjoyed the idea that Barry caused all this and it made up for the Thawne’s absence for much of the series. I think we may have even discussed this prospect in a previous post. KevinMLD: I’m still not sure how that leads to Nazis taking over South America. When I finished reading it, I felt like I needed to reread the series from the start because I’m not sure they planted any evidence that Barry caused this anywhere earlier in the series and that bugs me. There was even a Road to Flashpoint issue highlighting Thawne recognizing that the Speed Force was basically time travel and pointing out that Barry doesn’t understand that concept. PTB: He certainly seems to have a better understanding of it by the end of the series. It’s entirely possible that I was just wildly speculating that Barry caused the changes in time and there’s nothing on the page to back it up before this issue. I almost expected to learn that the original DC Universe was one of a number of failed attempts to repair the timeline. The page where Thawne reveals the results of Barry’s actions, which he’s since forgotten, is really well put together. We get a recap of what I think may be Flash: Rebirth or the recently concluded Flash series at the top of the page and the highlights of the origins of Flashpoint Superman, Hal Jordan, Batman, Aquaman and Wonder Woman. KevinMLD: The top of that page is new as far as I know. It’s Barry saving his mother and not from Rebirth as far as I can tell. 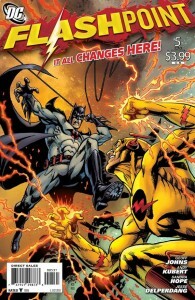 But the bottom are key moments from the Flashpoint universe. PTB: The two-page spread of the moment Barry remembers everything is less intricate, but still looks great. When Thawne first said he had freed himself from history and the timelines, I really thought he’d be left as the only one who remembered the original DCU or Flashpoint or anything other than the history of the New 52. Thomas Wayne took care of that. KevinMLD: He certainly did. But of course a new version of Thawne from the new DC Universe is sure to be in the queue. PTB: Element Woman and Cyborg get so little panel time in this issue after being built up last issue. They spend more time on Enchantress and it’s hard to care about her or Grifter and the Resistance knowing things are about to change again. Was Grifter and the Resistance a Flashpoint miniseries? KevinMLD: Yeah, all of this is just to give characters from the various mini-series a moment of screen time as the world spins out of control. As for Grifter and the Resistance, it was actually Lois Lane and the Resistance, but Grifter was a main character. Lois died in Project Superman. PTB: Dedicating a page or two to Enchantress makes more sense when she gets taken out hard by the returning Superman v1.0. KevinMLD: That’s a fantastic page. Lois has just died in his mini-series and in her dying breath begged him to stop the war. PTB: That’s pretty cool and really supports what you said last time about the coordination of this event. So Barry saves the day by stopping himself from stopping Thawne from killing his mother. I know I missed what exactly was happening on the two-pages where Barry is trying to run back into the time stream. What are these three timelines he’s seeing? Wildstorm, Vertigo and the DCU? KevinMLD: Yes, and it would have been an amazing moment had DC not just brought Swamp Thing and Constantine back to the DC Universe three months ago. What a stupid decision. PTB: Who is talking to him about these shattered timelines? KevinMLD: I have NO idea, but you know this is the beginning of the New 52 event for 2012. PTB: The scene where Barry wakes up in the police station is a nice call back to him waking up to discover the Flashpoint universe, as is his first instinct of seeking out Batman. PTB: Barry’s retained memories and the woman telling him how to “fix” things make me think they’re in place to maybe “fix” things down the line if the relaunch doesn’t take off. KevinMLD: There’s always got to be an emergency exit. PTB: Bruce reading the letter that Barry brought back from Thomas Wayne didn’t resonate with me at first, but the more I thought about it I found it to have a lot of weight. He hasn’t had his father in his life in any way since he was eight years old. While I appreciate it more now, I still wasn’t crazy about the dialogue on the final page but I know nothing of Bruce and Barry’s relationship. KevinMLD: I feel like writers love to make Batman cry because it should have extra resonance. I cringe. Otherwise it’s a nice moment. But don’t feel bad not really knowing anything about Bruce and Barry’s relationship. No one knows anything about it. Barry’s been dead for 25 years. PTB: I was expecting to see some evidence that the world is different, but if it was there I wasn’t getting it. KevinMLD: The only obvious difference I saw was their costumes. PTB: This is one of the rare instances where I saw the cover for a book I was buying for the first time on the shelf. It’s a great image and perfectly suited for what’s inside. KevinMLD: This is a cover that I really enjoyed. PTB: From the cover through to the final page, this is probably Andy Kubert’s finest work of the series. I see that Sandra Hope and Jesse Delperdang are both listed as inkers. Some pages look a little lighter than others, but overall I thought it was pretty seamless. KevinMLD: Agreed. I didn’t even notice. So in the end what’s your take on Flashpoint? To me it was far more successful than Brightest Day. PTB: I thoroughly enjoyed Flashpoint. It was absolutely more successful than Brightest Day. The only comparison I can even make is that the length of the Brightest Day series allowed it to contain a lot of the stories that likely went into the Flashpoint miniseries. It would have been nice to see some the things you mentioned like Lois asking Superman to end the war, but I still enjoyed the series without them. I’ve made no secret that I’m a sucker for alternate realities and timelines, but Flashpoint hit all the right notes. Even without knowing where these characters started out in the DCU, I appreciated the unknown elements of their new world. Hopefully some of that carries through to the New 52.